Harold Irvin Stensland, age 103, of Gordon, passed away April 4, 2019 at Middle River Health Center in South Range. He was born March 30, 1916 in Iowa, the son of Edward and Theolina (Strum) Stensland. 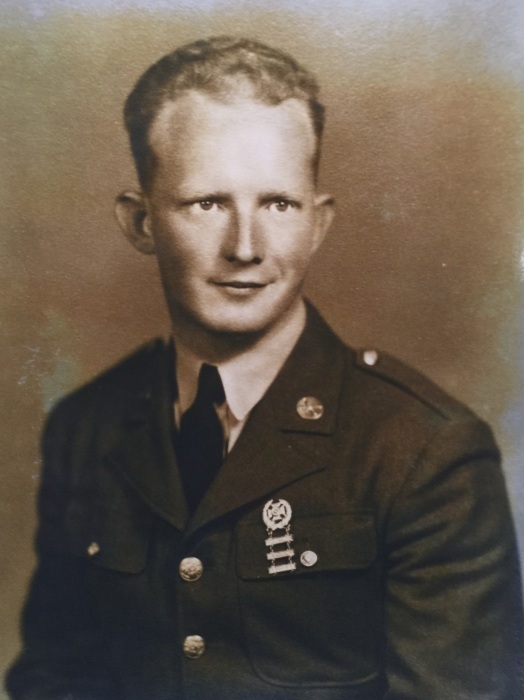 Harold proudly served his country as a paratrooper and mortar gunner in the United States Army during World War II. He worked for U.S. Steel in Duluth for over twenty-five years. He moved from Iowa in 1926 and homesteaded outside of Gordon. He loved the northwoods and enjoyed planting trees, cutting wood, atving and deer hunting. He also raised chickens and rabbits. Harold always had his radio with him to listen to Bob Uecker call the Milwaukee Brewers baseball games. He is survived by his children, Carol (James) Higgins of Winston-Salem, NC, Richard Stensland of Milwaukee, WI, Norman (Diana) Stensland of Gordon, WI, Charles (Cheryl) Stensland of Solon Springs, WI, Kay (Howard) Flamang of Hayward, WI, and Roger Stensland of Mukwonago, WI; eight grandchildren; sixteen great-grandchildren; two siblings, Barbara Lawrence and Edward Stensland; and many nieces, nephews and dear friends. In addition to his parents, Harold is preceded in death by his first wife, Catherine (Swensen) Stensland; his second wife, Eileen (Christopherson) Stensland; and his siblings, Curtis, George, Art, Ellen, Lida, Frances, Lucille, Helen and Hazel. A funeral service will be held at 12:00 noon on Tuesday, April 9, 2019 at Solon Springs Funeral Home, where visitation will be held from 11:00 A.M. until the hour of the service. Pastor Jason Clifton will officiate. Interment will be held later this spring in Gordon Cemetery.